A couple of hours up the motorway from London lies the mac, a fine modern arts centre with multiple performance spaces. Surge In Spring was an all-day programme using all the spaces to put on a real variety of music. For the price of a restricted view seat in the Barbican you could see the four main acts, plus any of the 12 shorter free gigs. The whole programme was put together by Sid Peacock, leader of the Surge Orchestra. Sid is an imaginative composer, arranger and educator who takes a very broad view of musical styles and this festival reflected that. Throughout the day there were around a dozen free short sets in either the small Hexagon theatre or the bar, and I could only catch a few of these. 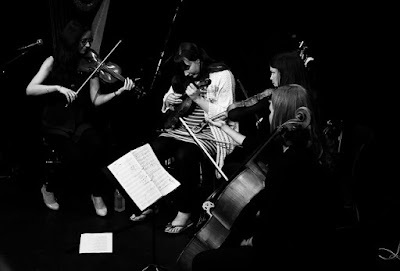 The Froe is an all strings folk band that came together at Birmingham Conservatoire, including Ruth Angell and Helen Lancaster, both members of the Surge (Ruth is also Sid Peacock's partner in the Peacock Angell conglomerate). It featured some very delicate arrangements and nice songs. I missed most of the experimental Drawlight that was paired with them and from reports afterwards it sounds like I missed a good one. What was impressive about the programme was the sheer variety of it. There were school bands, Asian bands, African and Caribbean bands – music everywhere. The four main concerts got off to a flying start with a really storming collaboration between the Surge big-band and the Ray Prince Gospel Project. A complete contrast followed with free improv jazz from Paul Dunmall, John O'Gallagher, Mark Sanders and Steve Tromans. 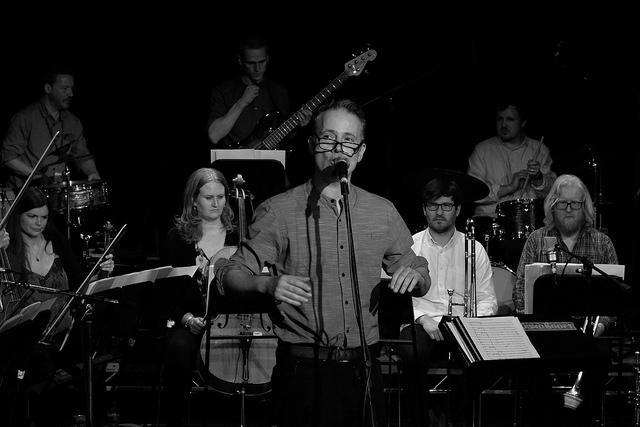 The third concert was a reconstruction of Indo-Jazz Fusions featuring Jonathan Mayer (son of the original creator John Mayer who was a long time teacher in Birmingham). I was a big fan of the first version back in the 1960s, and it's great to see the music being revived and developed, with new versions and new tunes - even if it never really stood a chance of coming up to my nostalgic memories of the original. The day finished for me with a rare live performance of the full Surge Orchestra performing pieces from its excellent CD La Fête. I'm very impressed with Surge as a band. In full flight it's a powerful animal with a stonking sound. Maybe not the most perfect or elegant, but bags of invention and bags of fun. Sid Peacock himself is one of those rare jazz artists who really engages with the audience and brings them in to the performance – he chats, tells stories, bounces around and generally makes sure everyone has fun. I'm full of admiration for what Sid has achieved in this project, administratively almost more than musically. So many different bands, so many different styles, and so many young people and children enjoying the music. This was a music festival after my own heart, so let’s hope the funders agree to make it an annual event! Surge In Spring was the first Grow Your Own festival, a new initiative in conjunction with Birmingham City University and supported by Arts Council England and mac, Birmingham.